Back in my student days, The Royal Oak's menu featured a childhood classic: a fish finger sandwich. Now, I personally like my fingers of fish just the right side of burned and served in a barm cake (that's a bap to anyone not from Lancashire) with a healthy dollop of ketchup. Although the Oak's offerings were never quite charred enough for my curious palate, they were certainly a tasty reminder of my infancy and ideal comfort food, so I have to admit that I was hoping to tuck into one of these bad boys on a recent visit. But the fish finger days are over, folks. Although its menu always boasted more sophisticated offerings than my meal of choice, the Oak's gone a bit gastro since I left full-time education. With a menu that changes regularly (a good thing in my book, as long as it's kept up to date online - which the Oak's is), the Oak dishes up pimped-up pub grub such as beer battered haddock & chips with minted mushy peas and tartare sauce and slow-cooked lamb shank shepherd's pie with carrots and broccoli (both £8.75). The vegetarian options are a little less 'British classic' however, and I feel that this is what may have prompted my wave of fish finger nostalgia. 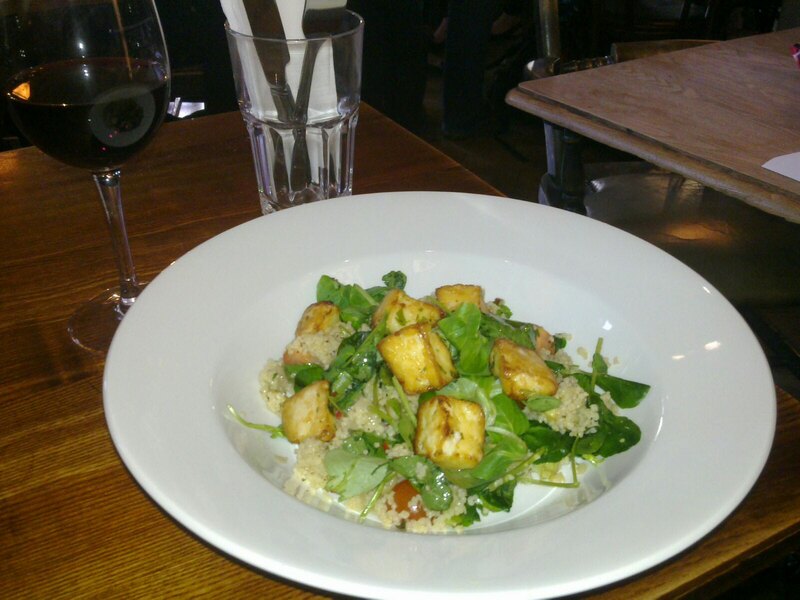 On a spring evening, a dish of warm halloumi with toasted cous cous and a bean and avocado salad with chilli and lemon (£8.75) sounded just the ticket, if a bit of a mouthful. However, the portion was pretty small given the price tag, especially considering it equalled thoe cost of many of the meat dishes on the menu. I know halloumi isn't the cheapest cheese, but even so - £7 would have been a much fairer price. The halloumi was certainly the star of the salad: good quality, gorgeously rubbery cheese marinated in an unidentifiable but tasty sauce. Sadly, its supporting cast let the magnificent halloumi down: far from being toasted, the cous cous was slightly soggy, and the avocado put in a 'blink and you'll miss it' appearance. I was pretty disappointed, especially when I belatedly noticed that for 25p less I could have gone for the two course prix fixe menu, which is available from Monday to Friday and features such delights as salt and pepper squid with lime mayo and pea and mint risotto. If only I'd have found the card lurking under the main menu before ordering. The Royal Oak fared much better in the British classics test, however. A's free range Gloucester Old Spot sausages were served on a bed of crushed pea mash and red onion gravy, and for £8.00 packed a much better portion punch than my skinny salad (I know, I know: don't have salad in a pub. Lesson learned). He rated it 'better than expected' (probably after my moaning), with the sausages tasty, the peas a pleasant addition to the mash and the gravy delicious. So there you have it: the slightly gastro Oak is a winner for carnivores, but not such a hot tip for pescetarians and veggies. Bring back the fish finger sandwich, I say. Verdict: 5. Should have had the fish and chips. I tried to go there last week when ravenous and was told it was an hour's wait for food. That probably would have killed me so had to go elsewhere or I'd have eaten the other customers. Back in the 70s I was a junior doctor at the Radcliffe Infirmary opposite. My room was the one with the circular window in the pediment. This was handy because I could see when the Oak opened in the evening.